A while ago, I sent out an email to the good people on the stonesoup email list asking what their biggest problems are when it comes to cooking. I also asked if there was anything in particular that people wanted to learn more about. Freezing food popped up in quite a few responses, so I figured it was about time to discuss the ins and outs of freezing food at home. Today I thought I’d cover the golden rules of freezing and in a few weeks we’ll look at the art of defrosting safely. It’s also the perfect excuse to share the recipe for a great little salad. 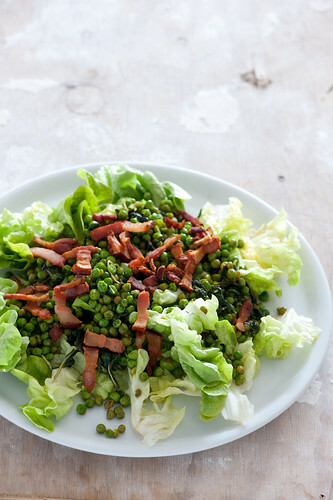 A salad where good old frozen peas are the star of the show. My Irishman and I shared this for lunch on Friday and it was wonderful. But I’m also thinking it would make a great side salad to serve with a simple roast chicken. Freezing doesn’t kill food spoilage yeasts and bacteria. It slows them down dramatically but, they’re still alive. Once food is defrosted, the little critters can get going quite quickly, so if you freeze the food again, you can be freezing much higher levels of microbes that may make the food unsafe to eat. By sticking to rule number 1, you minimise the risk. By cooking the food you’re effectively killing the yeasts and bacteria and bringing the food back to safe levels. So think of it as starting with a clean slate. The problem with putting hot food in the freezer is that it can increase the internal freezer temperature for a while and possibly start to defrost the already frozen food. It makes more sense to cool first but make sure you’re not leaving food sitting around for long periods of time at room temperature. Freezing is a great food preservation technique but it’s only going to be as good as the food that goes in. Best to freeze food at it’s freshest so that it will be at it’s best once defrosted. The wonderful sweetness we take for granted in frozen peas wouldn’t be possible if the peas were old when frozen. The air in your the freezer is very dry, otherwise you end up with the insides of your freezer looking more like an igloo. If your food is exposed to the air, it’s going to loose moisture, dry out and get that awful freezer burn look and flavour. Don’t assume that all plastic bags are going to protect your food in the freezer. Best to go with bags that are designed for freezer use. Or better yet, invest in some pyrex containers that can go from freezer to oven. Water, and therefore food, expands when it freezes. Make allowances for this and avoid messy explosions. There are 2 benefits here. First is that smaller volumes will freeze and defrost more quickly. Second is that you can just defrost and use what you need rather than having a whole heap of food on your hands. As my Dad found out recently when he splurged on gluten free bread and popped them all in the freezer without slicing. * Bread. Just slice it first! * Cooked rice. Great to have on hand for egg fried rice. * Berries. If you ever find yourself with a berry glut, freeze them in a single layer on a tray. Then pop them in a freezer bag or container. * Pastry. I always make more than I need then freeze the rest for later. * Herbs. While they will loose their fresh appearance, the flavour will still be great. Especially good for the woody herbs like rosemary & thyme. * High moisture fruit & vegetables – like celery or lettuce. When the water expands it damages the vegetable cell walls which turns them to mush when they thaw out. * Garlic. OK I’m not 100% convinced on this but Maggie Beer says that freezing garlic changes the flavour. Interested to hear if anyone knows about this. * Jam. The pectin which causes the jam to gel breaks down at freezing temperatures. What about your freezing experiences? Anything I’ve forgotten to include here? When I was little, peas were my most hated vegetable. For years I’ve avoided them like the plague and have been picking the little green devils out from all my meals. These days I’ve learned to love the pea. First step was mashing them so they didn’t look so pea-like. Then I moved on to fresh peas I podded myself. Nowadays I think they’re my favourite frozen vegetable. Who would have thought? If you’re feeding vegetarians, the bacon could be replaced with little batons of smoked tofu or a few handfuls of toasted nuts. Flaked almonds or pinenuts would be lovely. I have a bit of an obsession with sherry vinegar, but feel free to swap in your favourite wine vinegar or even lemon juice. I used green oak lettuce and baby peas here, but any combination of leaves and peas would would be great. 1. Heat a few tablespoons olive oil in a large frying pan. 2. Cook bacon, stirring occasionally for a few minutes, or until crisp and delicious. 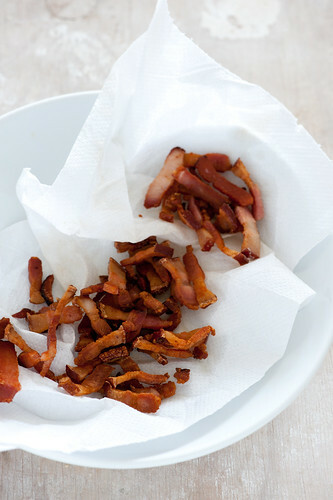 Remove bacon from the pan and drain on paper towel. 3. Add peas to the pan and cook stirring for a few minutes or until starting to shrivel a little. Stir through mint and 1 tablespoon vinegar. Remove from the heat. Taste & season. 4. Meanwhile, whisk to combine the remaining 2 tablespoons vinegar with 3 tablespoons extra virgin olive oil in a large bowl. Season. 5. When you’re ready to serve, toss leaves in the dressing and divide between 2 plates. Spoon over peas and finally sprinkle with bacon. ps. Tired of deciding what to cook? Looking for a weekly meal planning service where someone else comes up with the ideas for what to have for dinner? 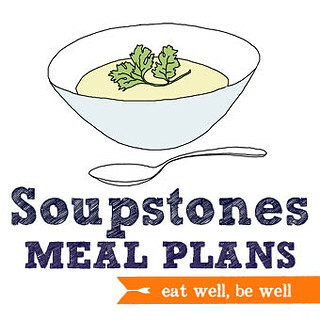 Then check out my Soupstones Meal Plans. label and date, and don’t just say “soup”, be specific, because 6 months later it is easy to forget which soup it was. I should probably start by telling you how inspiring you are :) and Thank You! for that. Then I’ll apologize for not commenting. (Also, I too am a recent convert to enjoying peas. Go figure. The Man likes them and I like to feed him vegetables.) I love your scholarship idea. Question on freezing: my mom always told me that potatoes did not freeze well. I admit, I can’t quite figure them out – soups and stews seem to work but everything else turns brown. As one who a) can grow potatoes (yay me!) and b) cooks in quantity to make my life easier; I’m befuddled on how to work with the potatoes – other than cooking fresh each time we want to eat them. Ideas? Thanks! Boiled potatoes don’t freeze well. I’ve experienced that when freezing soups who use potatoes, but if I purée them, then it’s another story. While you can’t freeze eggs in the shell, once they’re open, they freeze pretty well. If your recipe calls for only yolks, you can freeze the whites for later – and vice-versa. Just be sure to label – there’s no way to tell by looking if you’ve got 3 egg whites or 5! Great post, Jules. I have to say, commercial frozen peas are not my favorite veg, but they do seem to be better now than they were when I was a child… The best are still the ones from your own garden, or local farmer’s market. And, if you freeze your own, you can – as you point out – put them in packages sized to fit your family’s needs. I’ve frozen milk a few times when there’s been a really good sale and enough room in the freezer to accomodate. I second the labeling advice..containers go in with good intent but gets lost in translation when frosted over a few months later. Great reminders. Thank you. Fresh mushrooms also freeze quite well. Although they usually contain a lot of water, they don’t loose much texture while unfreezing. The advantage over drying is the much faster and easier procedure. I must admit that, as a nose-to-tail cook, I would probably attempt to use the bacon grease in the dressing. It seems like that would make the salad just a little more bacony. I’ve never put any oil in the pan while cooking bacon! I also really love doing bacon in the oven, since the chance of burning the ends while the middles are still floppy is eliminated. I learned this trick from Peter Reinhart in the Bread Baker’s Apprentice. This salad sounds delightful, and Ima try it this week. My 4 year old daughter thinks frozen peas are better than popsicles, and who doesn’t love bacon? We freeze 1-litre cartons of milk every week and use them up in order of expiry date. They thaw in the sink overnight, or in the fridge over 2 days. Just shake before opening. I agree with labelling everything with the date, a little information on the ingredients, and the portion size – otherwise there are some mysteries weeks later. I also find freezing boiled potato doesn’t work, though if I have mashed them with egg/cream they are fine! Freezing eggs is fine (as I think someone else has mentioned) as long as you crack them first and label how many whole eggs/yolks/whites are in the container. I have never had any success defrosting a hard boiled egg. The texture has been terrible annd rubbery each time! Freezing christmas fruit cakes with nuts in them has not worked for me either (though freezing cakes with ground up nuts in them seems OK!??). I felt sick eating it – it is almost as though the nuts turned stale or soaked up too much liquid? Wow! This is a timely post. We’re canning and freezing a lot of harvest foods today. The only thing I’d like to point out is that not all jams have trouble freezing. We make a raw freezer jam where you can make a large batch, put it into freezer containers, let it set for thirty minutes on the counter or in the fridge overnight, and then freeze until needed. Works beautifully, and I prefer the flavor of the raw jam over the traditional cooked jams. In regards to freezing garlic, I definitely know that it tastes just fine. At my house, we’ll mince a whole bunch of garlic at once, and freeze them in glass jars or make garlic “patties” that get wrapped with plastic (not my preference). Whenever I need it, I’ll break off some pieces :) The only thing I have to account for is the occasional additional moisture from bits of ice on the garlic. Great post thank you! I like to freeze grapes and eat them for dessert. Has anyone ever used dry ice to freeze anything? Allegedly it keeps the flavor of things like strawberries better? Garlic, even whole peeled cloves, freezes just fine… but it does effect the flavor. It makes it slightly milder in flavor, which I personally LOVE. We got an incredible amount of garlic from our CSA last year and I have never been so happy that I took the time to remove each clove and freeze a huge bag of them… whenever I need garlic I only need to reach into the freezer for a clove and let it defrost on the counter for literally only a few minutes! This is my first time visiting your blog, and what do I find? A post on one of my favorite current topics! I like to freeze ingredients that make up parts of other meals so that I’m ready to go when I get home. Right now, I have 47 cups of homemade lasagna sauce in the freezer! It’s the most time-consuming part of my lasagna-making, so I cooked once for several lasagnas down the road. I also have a ton of veggies frozen for specific meals, already measured out so that all I have to do is dump it in–you can freeze almost any vegetable as long as you blanch them first. Bacon is the reason I cannot be a vegetarian. It is lovely with lettuce and peas and most other things. Well done. I don’t freeze something that even part of it was frozen previously. Example, if I make chicken soup from raw chicken that I had in the freezer, then I don’t freeze the soup. wow I’m inspired by your 47cups of lasagne sauce – you’re right it’s great to prepare in bulk. yes grapes – wonderful frozen. and dry ice does tend to work better because it’s so cold it freezes super fast which mean smaller ice crystals. but it’s a pain to get a hold of. lucky you having ‘harvest’ time. I love it. Your freezer jam sounds like its not using the pectin from the fruit to get the texture which is why it is fine. Sounds lovely. yes milk freezes well. I should have said that. thanks for pointing it out. and thanks to everyone on the labelling question. I know it’s a good idea but I rarely do label so didn’t want to espouse something I don’t follow myself. I was wondering if commercial peas have improved over the years… maybe it’s not just my childhood phobias. I’m actually planting some peas this year so hope I’ll be able to second you on the fresh-from-the-garden goodness. I always have soup left over and often freeze it. But I have never frozen soup that has cream or milk in it because I don’t know if it’s ok to do so once it’s been “cooked”, as it would then have to be re-heated again after thawing. If I can, I try to remove the made-up soup to be frozen before adding the milk, and then add it just to the quantity I am going to eat now. Then I add milk to the thawed out soup when I re-heat it. But sometimes I can’t do this. Do you know the answer to this one? I’d love to know. I finally got over my fear of making things with egg yolks when I realised you can freeze the whites! Just have to keep a little score on the lid of containers with egg whites in saying how many there are. I’ve always frozen garlic, and my dad did the same. I don’t think it changes the flavor a lot from non-frozen garlic, but even if it does, it’s still better than pre-minced garlic in a jar, which is what everyone else I know uses. Whole cloves, people! Great post! I always make tons of sauces to freeze. My husband and I love to make pizza pot pies on weekends. Every month or so I make a big batch of thick pizza sauce and freeze individual portions so that for the next few weeks I can just pull out a baggie of sauce. I wish that I had a big enough place to have a large standalone freezer. Oh well, someday! great post jules, just a question, does pasta with carbonara sauce freeze okay? I know its got the cream in it. quick question from me… what are peoples’ experiences of freezing basil leaves? I’ve tried a couple of times and they’ve turned to mush (I froze them as whole leaves in a bag). I find basil freezes best as a puree. In autumn I always make up pistou (basil, garlic and a bit of olive oil) and pesto (basil, garlic, nuts, parmesan & olive oil) and freeze it in appropriate sized dollops for use during winter and spring. It’s much nicer than bought stuff and I can tailor the recipe to my tastes. You can mince up just plain basil, too, and freeze in the same way. Ice cube trays are handy for freezing it, then pop the frozen cubes out and store in the freezer in a bag or container. For freezing sauces, I like my food saver bags, so I can fill them up with about 2 cups worth, chill them good, flatten and seal. They stack so much better that way and I feel organized. The sad side of freezing food is when your 5 year old chest freezer dies while you are on vacation. I cried. I also found the missing pork roast as we emptied it, and learned we didn’t care for that squash soup since the leftovers were all in there. But now I have the big shiny new upright that I really always wanted but couldn’t afford back then. fabuloso derencio mi vadrarm te adeslamo ditidamo carquiu. chimo te ngeis agres nos ralfimos o aradim dento ansfo bien. Outstanding post, I conceive people should larn a lot from this web site its rattling user friendly. So much fantastic information on here :D.
Avocados are one of my favorite things and they’re so cheap when they’re in season, but expensive when not. Is there any way of freezing avocado? You could try it, but I’d suspect they will end up with browning… but you never know. Store-bought guacamole in vacuum sealed pouches freezes well. You could make your own guac and freeze it. My guac recipe is 2 avacados, the juice from half a lemon, 2 tbsp onions, 2 tbsp olive oil, salt to taste. This is not from experience, but if as C says that the guacamole freezes fine, you could possibly try peeling & cutting your avo, tossing/basting it in lemon juice & try freezing it like that in a sealed container. Im guessing that the acid /may/ be what prevents the browning with the guacamole – given that this works for preventing oxidization with apples etc. No guarantees though – but if anyone tries let us know if it works! Might be worth trying the lemon juice trick & seeing if it makes any difference with the browning. 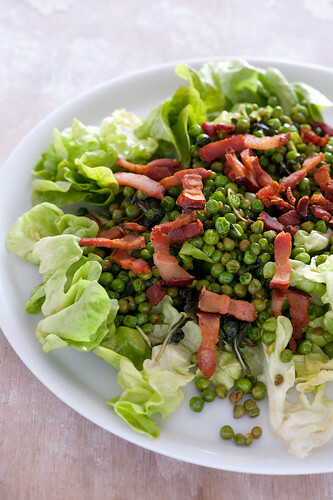 I have to actually make this salad at some point – it includes 3 things I love: bacon, peas & vinegar. This also reminds me a little of the pork & mushy peas we used to make on the farm. Often just sticking a pot & pan over the fire, pork (and potentially potatoes) in the latter & peas, mint & onions/shallots in the former. I’ve got the opposite story; we grew up semi-vegetarian, and while in general my parents didnt have trouble feeding us veg in general, they DID have a problem keeping me from eating all the peas before anyone else got there! Sometimes when very tired (having a severe chronic illness sometimes means prepping ANYTHING at all is too much) I have been known to simply microwave a tin/bag of peas & call that dinner. So we always have peas in our freezer/cupboard. It’s a lifesaver. I froze stew and upon thawing the meat just fell apart into strands. I thawed two different packages two different ways with the same result. First I left a package in a bowl in the fridge and once completely thawed I warmed it up in a pot and all the meat fell apart. Second package I tore open and put in a pot with low heat until it completely thawed and warmed up and the same result. Why? Eggs Freeze wonderfully, you just need to know the tricks! Freezing is actually great for preserving vitamins and nutrients. The only downside is textural changes like the ones you experienced with your celery. If you can get it to go through your juicer totally use it!